Benjamins Estate Agents are please to present to you..... your new super low energy family home! 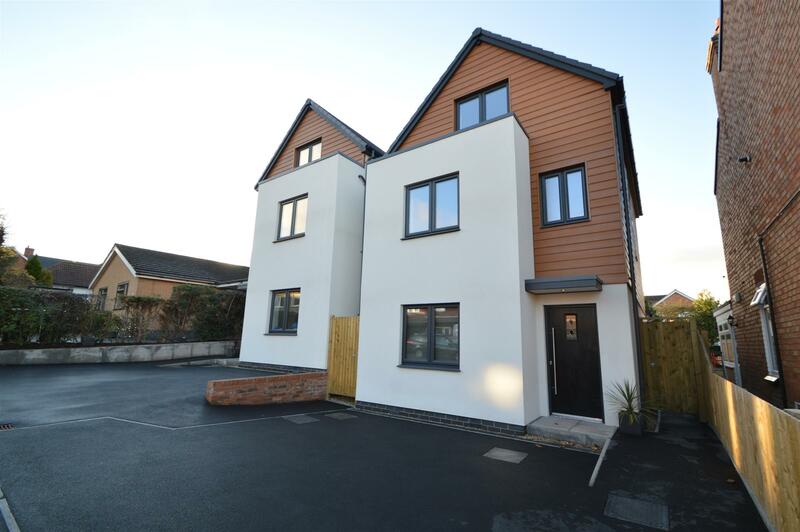 Two unique, architecturally designed family homes in the heart of Keyworth. 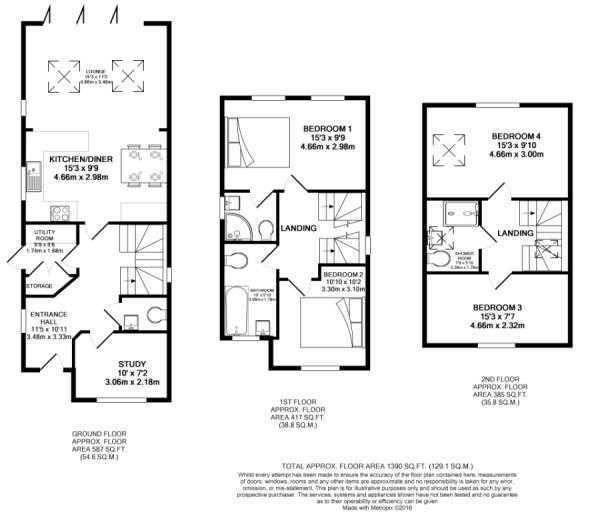 With four bedrooms, a study, utility room and a huge open plan kitchen/diner and family area, complete with bi-folding doors... your family has all the space it needs to grow. And because it is a Positive Home, your energy bills will be as low as they possibly can be. The homes come with free solar PV panels and are built so well they need only the smallest amount of heat to stay fresh and warm, all year round. Compared to an older house and even other newly built houses, you will save hundreds of pounds a year on heating and lighting your Positive Home. Enough to go on holiday, or save for when the kids go to university! Upstairs there are FOUR double bedrooms, two on the first floor and another two on the second floor. There is a luxurious family bathroom and two en-suites, all with the best fixtures and fittings. To the front there are two off-street parking spaces. To the rear there is an already-established garden and a large patio, perfect for opening the folding doors and entertaining throughout the summer. With spacious open plan living areas and contemporary styling throughout this new home offers everything a family needs in a great location. Enter into the spacious entrance hall. With adjoining study, downstairs WC and utility the entrance hall has feature staircase rising to the first floor and second floors and is flooded with light front the roof windows above. The hall leads first into the kitchen / dining area and then into the main living room. This area of the house is illuminated by roof windows and has bi-fold doors leading out onto the patio and garden. The kitchen features top of the range 'Halvanto' floor standing and wall mounted units with breakfast bar and quarts worksurfaces. Integrated appliances include induction hob, electric double oven, fridge and freezer. There are two double bedrooms on the first floor. The master bedroom has an en-suite shower room with corner shower, semi-pedestal wash basin and contemporary wall mounted WC. On the second floor, there are a further two double bedrooms and a shower room. Outside, there are two off road parking spaces to the front. To the rear is a generously sized garden and patio, accessed from either the side path or from the bi-fold doors in the lounge. Positive Homes builds to the very highest standards. Every home features a continuous air and heat seal around the core of a timber framed structure. They come with mechanical ventilation and heat recovery system, air-source hot water heating, LED lighting and triple glazing to produce a eco home based on the German 'Passivhaus' model. Dale Road is the future of home design and construction. Dale Road follows the most stringent Building Regulations specifications for air-tightness and heating, based on the German 'Passivhaus' model. The home requires only 10% of the heating needed to warm a typical house in the UK, because its so well insulated. The mechanical ventilation system provides a constant supply of clean, fresh air that is vital for the health and wellbeing of the household. "Its a strange sensation when you first walk into a Positive Home in the winter. The home is lovely and warm - but the air is so clean and fresh, like a spring day. Only then do you realise how a typical home trades comfort for warmth, because all the radiators blasting away dries the air so much. Its beautiful!" Martin Valentine, Positive Homes Managing Director. HOT WATER - HEATED BY THE AIR! At the heart of the home is a unique hot water tank system. This is linked to the ventilation system to use warmth from the air to heat water. This incredibly efficient system means its cheaper than gas to heat your water - and better for the planet too. Every window is triple glazed. This means there is less heat loss from inside - but also a big reduction in noise pollution from the outside. Because the home has mechanical ventilation, the windows do not need air vents - reducing drafts and heat loss even further. "We think and act differently to other house builders. It's not enough just to create new, super-energy efficient, sensibly priced homes. Our plan is to make sure the local economy and local communities benefit from every house we build. We buy materials from local suppliers, and will use local trades people wherever we can. So when you buy a Positive Home, you're not just investing in your family's future - you're investing in the next generation."